We meet every week to run, walk and trek through the amazing country-side, rice paddies, alleys, parks and mountains of Bali Indonesia. Afterwards we conduct an entertaining ceremony known as “the circle” where we enjoy cold beer and soft drinks and share some good times and good laughs. We’re a very social group. Our members come from all walks of life, all age groups and all abilities of running and trekking from slow to fast. Our one and only goal is to have fun! Each week we run through the amazing countryside and trails of Bali most importantly we enjoy the fellowship of our friends. Join Bali Hash House Harriers 2 because life is too short to spend Saturday nights in a pub. Get away from crowded tourist spots, get some exercise, see the lesser seen side of Bali, make new friends and most importantly drink some beer. We encourage visiting hash members from other kennels all over the world to join our hash on Saturday. You’ll find our hash is interesting, fun and lively and we’re always open for a song or two from visitors. For first time runners of a Hash Bali Hash House Harriers 2 is a great way to get into the spirit of the runs. You will find we are very welcoming to new runners and people will go out of their way to assist and give guidance to “Virgins”. Read below or ask someone about the trail markings so you understand how a run is set. We are a Hashers Hash and take our traditions seriously (or as seriously as you can downing a tankard of grog) besides that We also drink beer! There are some great trails here in Bali and the terrain can be flat and dry or extreme and wet. Some trails are flat and some are not, some cross rivers and some don’t. If you’re into Walking, Trekking, Hiking or Trail Running, then Bali Hash House Harriers 2 is the place for you. Besides that, hash is the best way to see the awesome views that Bali has on offer. We generally have a Long Trail for runners and a Short Trail for walkers. If you love trail running, hiking, walking or trekking and want to see the real, raw side of Bali come to Bali Hash 2 and see the Bali that we all fell in love with. Join Bali Hash House Harriers 2 make new friends and see the magnificent views of Bali …. the views that 99% of tourists who come to Bali NEVER see …. after the run enjoy our free flow beer or the soft drink of your choice. At Bali Hash House Harriers 2 there are usually 2 trails you can choose from; a Long Trail for runners and a Short Trail for walkers. A split between the two trails will be marked with an S for Short and an L for Long. After the runs, we have open bar for the beverage of your choice: Beer, Water or Soft Drinks. This is followed by the “Circle”, which is where we gather around and say thank you to the Hares, welcome back old members who have been away, and welcome visitors and visiting hashers. We generally runs point A to point A runs, meaning that we start and finish at the same place. Just prior to the commencement of each run with Bali Hash 2, the Hash Master will hold a pre-run circle (a briefing of sorts) to provide you with information relevant to the run. Most importantly you should pay attention so that you’re aware of any hazards and get other key insights to make your run better and safer. Besides that, we sometimes traverse rather slippery and/or steep slopes, so try to wear appropriate footwear and clothing that does not restrict your movement. If you want to take some photos, please stop for a moment to do so and then continue on most importantly step off to the side so you are not in the way of people behind you. Taking your eyes off of the trail could result in a mis-step or even a fall because you never know when at stray rock or tree root is going to jump out in front of you. During a run there are markings to follow. The “Trail” will be marked with shredded paper, chalk, paint or some combination of those. The objective is simple: follow the paper until you get back to the finish. 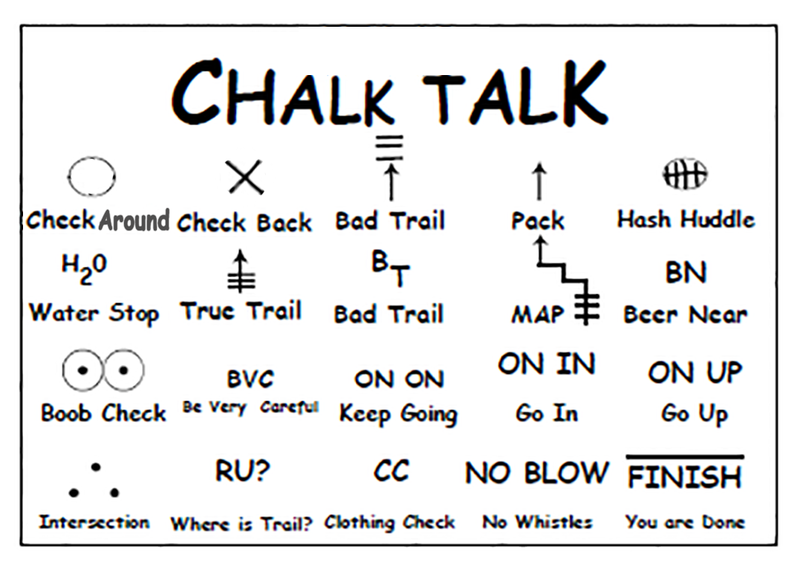 “Checkbacks” are false trails marked with an X, (unless it’s a “jungle rules” run) which means that the trail has come to an end and you must go back and find the trail which will be off to one side or the other. Besides that, you will need to keep an eye out for the paper as sometimes it can be difficult to spot. A circle means “Check Around” in which case you have to go in one of 2 or 3 directions to find the paper. If you want to ask somebody the correct direction, you will yell “Are You?” meaning Are You on Paper. The proper reply would be “On paper” if you are; or “Checking” if you are not. It’s also advisable to note the name of the run site in case you get lost so you can ask someone for directions. And remember, this is a hash run and we will adventure off the beaten track. So you might get wet or dirty or muddy (or all three) besides that you will have a great adventure with stories to tell. Most importantly, we recommend that you bring a change of clothes for after the run so you can enjoy the circle in comfortable dry clothing.